Today is International Talk Like a Pirate Day in honor of which ABC's Wife Swap featured the Baur family last night (John Baur is a co-founder of Talk Like a Pirate Day). It is only fitting that on such an auspicious day we here at Cinerati should do a review of material related to pirates and piracy. One could easily do a positive review of Pirates for the PC/Xbox, but if you don't own the game you are no true pirate fan! It is a must have. No...we here at Cinerati want to guide you into places you may not have looked before to be entertained, while at the same time not being so obscure as to be overly arcane and alienate the novice gamer. With that in mind, we would like to present the following review of the Sword and Skull boardgame published by Hasbro under their Avalon Hill label. The nefarious Pirate King has stolen Her Majesty's Ship, the Sea Hammer, pride of the Royal Navy. Furious, the Queen has offered a great reward to the person who can retrieve it. As one of the advisors to the Queen, you have chosen an officer of the Royal Navy to pursue the Pirate King. Of course, it might take a thief to catch a thief, so you've also conscripted a vicioius pirate from the Queen's dungeons. Now they are preparing to enter the dreaded Lair of the Pirate King. Will one of them be the first to recover the Sea Hammer? Or will one of your rivals receive the Queen's reward instead? Each player in the game is in control of two "Avatars," one Pirate and one Loyal Captain, who must find a way to bring the Sea Hammer back to the Queen. There are two ways to achieve this goal. The player can either raise enough gold to bribe the Pirate King to return the ship, or the player can defeat the Pirate King in combat forcing him to return the ship. The goals may be simple, but the accomplishing of them is not for it is good to be the Pirate King. Player's start out with little money and even less skill at arms. So each player must work their way around the track encountering various fortunes/dangers until they have sufficient lucre or puissance to attain the goal. The "track" element of the game requires the players to move around the track in a clockwise fashion and encounter the "space." 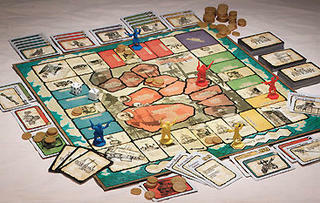 This element of the game is like a combination of Monopoly and Games Workshop's famous questing game Talisman. 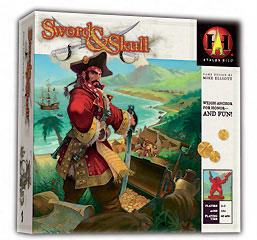 Sword and Skull at the same time lacks the complexity of either the games it borrows from, and adds innovation to each. It is an interesting paradox, but one that is true. As the players work around the board (pictured below), they encounter various "space" types. The two most common are "settlements" and "caves." At settlement squares the player can recruit crew to assist in the defeat of the Pirate king. These crew members are an absolute necessity and come in three types. "Money grinders," which are similar to property in Monopoly, provide the player with gold each time another player lands on a settlement matching the color of the money grinder and everytime the player passes the fort (think Go in Monopoly. What separates money grinders from property is that only the color of space matters and not the specific name of the individual square. Some settlements have three or four squares and if you have a money grinder for the settlement you are paid by the player landing their. Naturally, multiple players may have grinders at the same settlements. The second type of character is the "buffer" who adds combat skill to either your Navy Captain or your Pirate Captain (this is distinguished by a symbol on the card). Finally, there are crew who are both money grinders and buffers. Recruiting the right crew can lead to rapid victory, but it can also irritate other players. At caves players encounter various "monsters." These range from the simple Crocodile to Pirate Skeletons. This type of encounter is nothing surprising to your average "quest game" fan, but they have added an innovation. The difficulty of defeating each challange is based on the size of your crew, your total crew. So if your Pirate Captain has to battle a Siren and you have 6 crew members you will have a tough challenge. This is especially true if all 6 of your crew are money grinders or Navy Captain buffers. So it helps to have a balanced crew. Defeating challenges gets you items and gold, items usually help you in combat and gold helps the bribe victory. The games that I have played were fast and furious. The rules were clear enough that any inter-player bickering was due to cards which allow one player to "steal" items from another player (note: while this adds variety to games it can add "meanness"). The end game was close and all players had a chance to win during the last stages of the game. 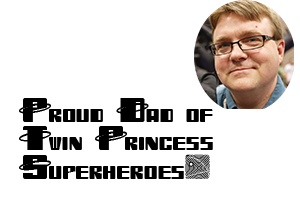 The game is simple and combines elements from board game classics. Of the two possible victory outcomes, the most rewarding seems to be combatting the Pirate King. This is true even though the more innovative of the two is to win by bribery. At the beginning of the game everyone knows how tough the Pirate King is, but no one knows how much it will take to bribe him until the end of the game. Click on Photo of Game Box for PDF copy of the rules from the Hasbro site.